Heading into tonight's game against the Sacramento Kings (now with newly acquired, rapidly fading, and stat-hating small forward, Rudy Gay! 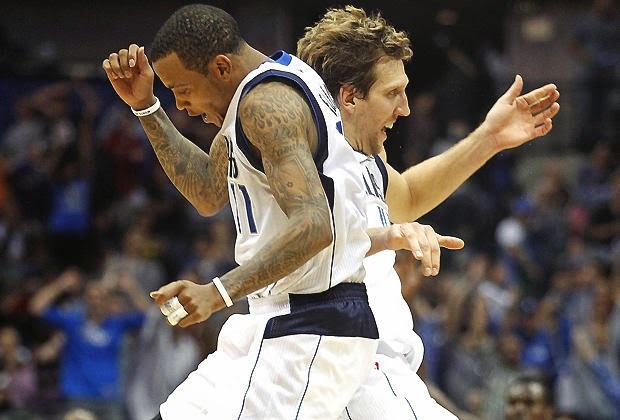 ), the Dallas Mavericks are riding a three game win streak. They are fresh off a thrilling, buzzer beater win over the Portland Trailblazers who (as we predicted last month) have become the toast of the NBA. Right now, the Mavericks are 13-8 and are sitting sixth in the Western Conference. They have the look of a team that could easily play spoiler in the first round of the NBA Playoffs. And it has come as somewhat of a surprise. How did we get here? Well, you basically have to look at three factors. First, Rick Carlisle is one of the best coaches in the NBA (as well as one of the best Popovich impersonators/Jim Carey look-a-likes on the planet). Second, Dirk Nowitzki is fully healthy and is torturing the league with his unparalleled variety of silky, off balance jump shots and herky-jerky, somehow-he-got-to-the-rim drives like it was once again the 2011 NBA Finals. Finally, potentially risky off-season acquisition Monta Ellis is playing the best basketball of his career. Monta's plight has been chronicled in numerous places (most expertly by Jonathan Abrams at Grantland) and in countless snarky tweets. And rightfully so. His eight year career averages of 19.5 points per game and 45% shooting on 16.4 attempts per game don't look terrible considering his reputation as a reckless gunner, but watching Monta in years past, you just did not see the shot selection and decision making of a true NBA superstar. After a fantastic, eye-opening year playing in the "We Believe" Golden State Warriors of 2006-2007 (16.5 points per game, 4.1 assists, 3.2 rebounds and 47.5% FG, 13.1 attempts per game), he spent the next four full seasons jacking up shots (15.1, 17.2, 22.0, 20.1 respectively) on increasingly depressing Golden State teams. He spent the past one and half seasons in Milwaukee where he and Brandon Jennings struggled to exist in the backcourt and generally played unpleasant basketball. Now, sharing the court with Dirk, disciplined role players and an excellent head coach, Monta is flourishing for the first time since he played alongside peak-era Baron Davis and a bunch of high-chemistry supporting players on the "We Believe" Warriors. He's averaging 21.6 points per game on 47% shooting (including a record high 38% from three), averaging 5.7 assists, 1.6 steals and, at 18.9, has his highest PER since 2008. He has teamed with Dirk to create a highly potent and dangerous pick and roll tandem that should only see the variety in which they attack increase as the season goes along and Carlisle has more time to experiment. Monta is just playing smarter. In Carlisle's offense, he has taken 50 three pointers so far this season. A fifth of those shots (a rate that should hopefully increase over the season) have come from the corners, where he is making 75% from the left corner and 50% from the right. Ellis has taken 78 long two-pointers and a trend that bears watching is as to whether or not his three point attempts catch up tom and surpass his long twos, which would signal a full sea change in his game. The majority of Monta’s shots are coming from within eight feet of the basket where he is shooting 49%, a number that will hopefully improve. But, on the plus side, he is shooting above league average in all areas of the mid-range, where he has taken 53 shots to date. In addition, he is second in the league in drives per game at 10.3 (behind only Ty Lawson's 11.1), and is one of only five players (Tony Parker, Evan Turner, Ramon Sessions, and Eric Bledsoe) who is scoring more than 6 points per game on his drives. Who is first on that list? Monta at 7.8 points per game. This is all part of the Carlisle coaching effect. Meanwhile, the Big German had simply been vintage Dirk. He's thirty-five years old and averaging 21.2 points per game, 5.9 rebounds, 51% shooting on two-pointers, 42% on threes, and 93% from the foul line—all on 15.5 shots per game. His 23.5 PER is basically identical to the 23.4 he posted in the Mavericks' 2011 title run. This season of Dirk is like ordering a fine digestif after a long, slightly innovative, and delicious dinner. It’s foreign, strong and full of finely aged flavor. And you just want to savor it. With Dirk and Monta playing together better than anyone expected (especially after Monta's "I'm gonna play Montaball" proclamation), the Mavericks have become a viable playoff team. They are receiving steady point guard play from Jose Calderon (11.4 points per game, a 1/5 turnover to assist ratio), classic intangibles and awkward but effective shooting from Shawn Marion, inspired bench play from Vince Carter (the classy veteran!? ), Jae Crowder and Dejuan Blair (9 points and 8 rebounds on zero ACLs! ), and are still expecting to have their big man rotation with the addition of Brandon Wright later in the season. Right now, the Mavericks are matched up with Oklahoma City in a potential first round match up. I know I'm getting ahead of myself by mentioning playoff seeding, but it's worth thinking about when measuring the Mavs' progress thus far this season. The Thunder would be favored in that series, but couldn't you see it going six or seven games? Couldn't Dirk outduel Durant one night? Couldn't Monta hit a buzzer beater just like he did in Portland on Saturday? It may be a long-shot, but it's better than any Mavericks fan was expecting going into the season. And after two disappointing post-title campaigns, the Mavericks are looking dangerous once again.